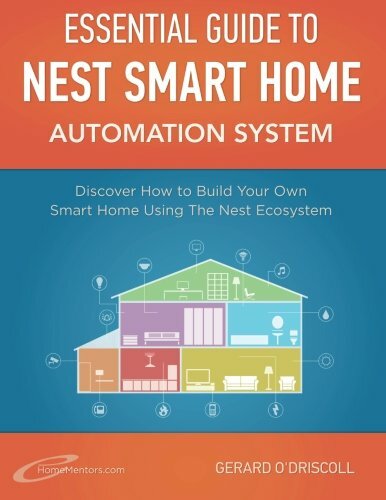 [PDF] Nest Smart Home Automation System Handbook: Discover How to Build Your Own Smart Home Using The Nest Ecosystem (Smart Home Automation Essential Guides) (Volume 5) | Free eBooks Download - EBOOKEE! Description: Want to use your smartphone to manage your heating, lighting, and family security? No problem, this book This book is broken down into four different sections. The first section describes Smart Homes 2.0, provides an overview of the Nest smart home ecosystem and explains the key benefits of the Nest smart home automation environment. The next section covers the Nest smart thermostat. An explanation of smart thermostats, the benefits of Nest and a step-by-step breakdown on how to install Nest, setting up scheduling, and monitoring your energy usage are provided to readers in this section of the book. The third section of the book introduces a second Nest product, namely the Nest Protect fire and carbon monoxide detector. The fourth section of the book explains IP cameraâ€™s and provides Finally, the last section gives insight into the â€˜Works with Nestâ€™ program. A detailed description of Gerardâ€™s â€˜Works with Nestâ€™ favorite smart home product categories is covered in this section of the book. â€˜Works with Nestâ€™ enabled smart bulbs, smart thermostats, smart locks, smart sensors, and garage door openers are all covered in this final part of the book. As with all Gerardâ€™s books technical illustrations, insights from Gerard and details of an awesome monthly giveaway are all provided inside this book. Please note that the Nest smart home platform is new and evolving. Therefore, customers who have purchased the book will receive updates to co-incide with Nest refinements taking place over the coming months and indeed years! 2018-01-20[PDF] Killer Camera Rigs That You Can Build - How to Build Your Own Camera Cranes, Car Mounts, Stabilizers, Dollies and More! 2018-01-08[PDF] Killer Camera Rigs That You Can Build -How to Build Your Own Camera Cranes, Car Mounts, Stabilizers, Dollies, and More! No comments for "[PDF] Nest Smart Home Automation System Handbook: Discover How to Build Your Own Smart Home Using The Nest Ecosystem (Smart Home Automation Essential Guides) (Volume 5)".